Ok so living plastic free is REALLY tough! I cannot believe how much plastic there is absolutely EVERYWHERE! And I am so much more reliant on it than I even suspected I was. I really thought after my first post about this that it would be easy to go shopping and reduce the amount of plastic packaging on fruit and veg. My plan was to go to a local farmers shop and pick up fresh veggies there while supporting local farmers. I honestly expected the veggies to be fresh from the farm and therefore still covered in mud, definitely not covered in plastic but they were! Everything had been washed and scrubbed and plastic wrapped! The most shocking thing of all? 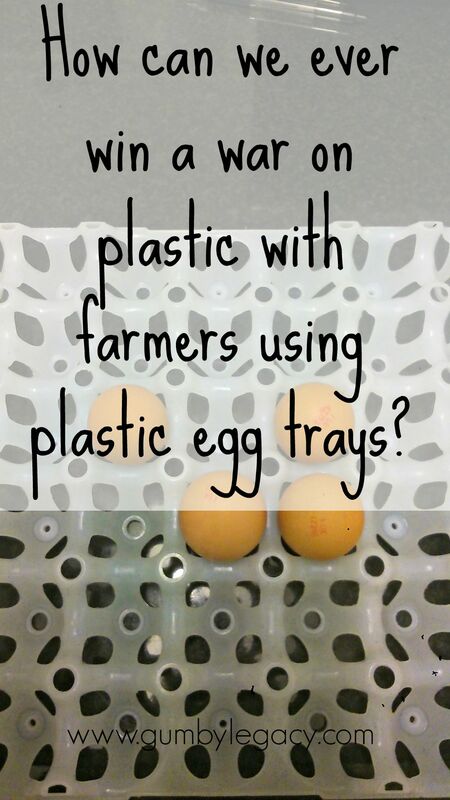 The large tray of eggs I picked up was on a massive plastic egg tray!! I could not believe it but because I had not bought anything and had to ask for the eggs from behind the counter I was way too embarrassed to say that I didn’t want them. I think the answer is to get sorted with some little re-usable bags for veg and fruit from the market and supermarkets cos you can usually get stuff loose from there anyway. I could not believe it. I tried to have a conversation with the woman behind the counter about the plastic packaging and her answer was that ‘plastic is recyclable’. No problem as far as she was concerned. I’ve had a couple of conversations like that. In a supermarket the other day there was a couple in front of me having a conversation with the checkout lady about the strawberries. They were saying that they were glad the strawberries were now in plastic trays again and not ‘those awful wooden boxes’. I couldn’t resist and said something along the lines of ‘well, at least wooden packaging is better for the environment?’ All 3 of them said no it wasn’t cos the plastic can be recycled. Recycling does not address the main issue of misusing plastic and stupidly using it to make one use throwaway items. The other thing I’ve done a couple of times is go into the local butcher where they sell massive trays of chicken breasts (24) in one large tray. I asked if they pack their meat in paper (like in the old days) but they looked at me daft! (I have to confess I would have too!) When I explained why they said that if I wanted to bring my own containers I was welcome to. I honestly don’t know if I will do that but if I can buy in bulk that will help. Although that causes me another problem cos I then put smaller portions in freezer bags which I then throw away cos I’m worried about not getting them clean enough to re-use afterwards? Need to check that out. I did find out that there are ways of getting milk delivered in glass bottles by having a look at this website so that’s something I will find out about. Our closest contact literally lives in the next street! Not sure where the milk comes from as there definitely isn’t a dairy farm there? Wet wipes and nappies. I am sorry but I just cannot stop using disposable nappies and wet wipes. Up until now I have always said that the top three best inventions are contact lenses, lady things (tampons) and wet wipes – all three made largely of plastic. On the nappy side of things I have got cloth nappies which I try to use when we’re in the house at least. I figure that by using even one cloth nappy a day that’s 365 less disposable nappies in a landfill site somewhere by the end of the year. Wet wipes: again, when at home trying to use wet cloths rather than wet wipes for wiping hands, faces and sticky patches on furniture. But I do still always have a pack of them close by when out and about as they are just so useful! Lady things – turns out that still breast feeding the baby at 16 months is actually a good thing in an unexpected way as the pill I’m taking means I haven’t needed to use them since she was born. I am definitely still buying far too much processed food and this is showing on my body as well as my rubbish bins! So this is yet another reason to focus on cutting out the plastic – maybe I’ll finally start eating more healthily and lose a bit of weight…. Buy and eat less packaged crap which practically means plan meals and bulk cook dinners from scratch to freeze for when needed. Take food from home to work: BE MORE ORGANISED!!! That’s it for today folks 🙂 Thanks for reading and please do let me know if you have any advice or tips for those of us trying to reduce the amount of single use plastics we use! Thanks for stopping by Wendy! Glad to hear about the paper bags at markets – I keep meaning to go and get stuff from there but unfortunately nowhere near as convenient to just pop in as it is to the supermarket!